Photograph collection of webmaster An early photograph of D5044, date unknown, but presumably at Stratford judging by the types of locomotives surrounding it. The locomotive appears to be in 'as delivered' condition from Crewe, it has gained the yellow warning panel and a steam style shed plate attached to the cab front. Surprisingly the roof mounted boiler water tank filler cover is still in place. The sixteen year three month career of D5044/24044 saw allocations to Eastern Region, Southern Region and London Midland Region depots. Full size fuel & water tanks (retained until withdrawal). Original exhaust port covered but not immediately removed (circa 1963). October 1959 to March (31B). July 1960 to Ipswich (32B). November 1960 to Hither Green (73C) on loan, made permanent November 1960. January 1961 to Ipswich (32B). August 1967 to Stoke Division (D05). January 21st 1976 to unserviceable store. January 31st 1976 - withdrawn. After withdrawal 24044 was stored at Crewe until October 20th 1976 when it moved to Swindon Works and scrapped there by the third week of January 1977. Movement: 24026/31/44/76 Crewe – Swindon October 18th 1976 by 25245. Noted Derby Works November 1965. Noted Crewe Works June 1968. Noted Derby Works March & April 1969. Noted Derby Works March & April 1974. A design change was instituted from D5044 - the OK4616B steam heating boiler installed in D5000 - D5043 was replaced by the model L4610 capable of a steam rate of 1,000lb/hr. This boiler would become the standard for all further Class 24/25 orders The water tanks were reduced to 450 gallons giving a loco weight of 77 tons. Whitsun Bank holiday found a number of Type 2s visiting Southend with excursions from the north London area, so noted were D5032/38/44 & 77. 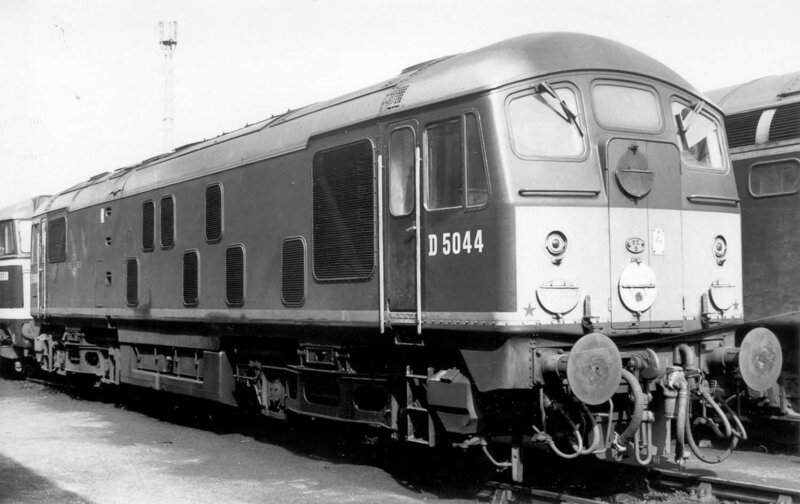 The Southern Region borrowed D5044 & D5070 from Ipswich during November due to a shortage of boiler equipped locomotives, the loan for D5044 was brief, it returned to Ipswich (32B) during January 1961. It is uncertain as to what use was made of these locomotives on the SR - possibly they might have been filling in for non-availability of the LMR Class 24's currently on long term loan to Hither Green. During the last week of January there were a number of Type 2 substitutions for the GE line Type 4s affected by the severe weather. So noted during this period amongst others was D5044 on the 12.40 Harwich - Rugby and D5018 on the 5.15 Colchester - Glasgow, both diesels being replaced at Peterborough. Condition May: green livery with small yellow warning panels (recently repainted? ), curved upper corners, frame level stripe not covered by yellow panel, small gap between bottom of warning panel and stripe, full size fuel & water tanks, steam style shed plate on cab front, two exhausts, the one above the boiler room blanked off, ridge sided sandboxes, two-rung bogie footsteps. D5044 was noted at Derby Works during November. 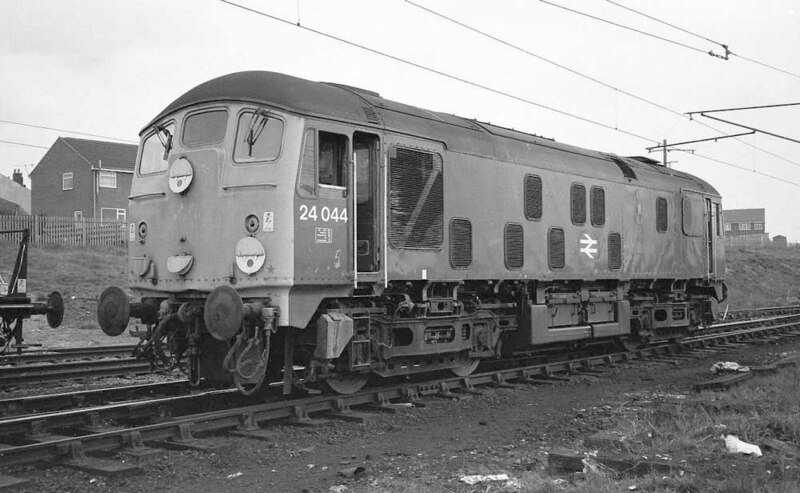 The use of Stratford as a heavy repair centre for the Class 24s had greatly diminished, with Doncaster and Derby taking over the overhauls, though Doncaster would eventually hand over its Class 24 repairs to Derby or Crewe. As part of the plan to remove steam from the North West a large group of Class 24s were transferred to the Stoke Division (D05). These transfers included the Class 24s from the southern end of the WCML and all the Class 24s remaining in East Anglia. This included 5042/43/44, this would be their last reallocation, and from now on all would be familiar sights in the Crewe area. Their duties would include the WCML between Rugby & Preston, the North Wales main line and its branches, the Cambrian lines to Aberystwyth & Pwhelli and the miriad of lines in the Liverpool and Manchester areas. Although primarily to be used on freight workings they would from time to time be used on passenger services, particularly on summer excursions and extras. All heavy repairs would now generally be handled by Derby Works. During April 5044 was noted at Derby Works, it was also seen at Crewe Works in June. 5044 visited Derby Works during March. Services over the North Wales mainline were severed on May 24th when a fire seriously damaged the Menai Bridge. Trapped west of the bridge were seventy two coaches and thirteen diesels including 5034/44/83. A local service was instituted between Holyhead and the specially re-opened Llanfair P G station using diesel multiple units 50404 & 56167. Two Type 2s - 5034 & 5083 were to be kept on the island, their boilers were made serviceable or fitted with recently overhauled ones. 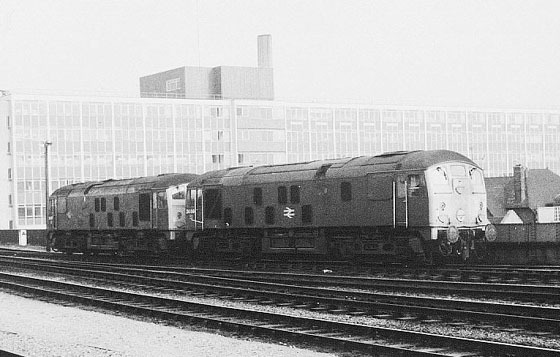 5044 and all the Type 4 diesels were later evacuated to the mainland by sea, giving 5044 the unique honour of being the only Class 24 to make an ocean voyage, albeit the short hop from Holyhead to Barrow. Condition June: very work worn green livery with full yellow cab fronts, gangway doors still fitted, full size fuel & water tanks, boiler room grills still present, hand/footholds still present, cab roof ventilators above doors present, three-rung bogie footsteps. 24044 received its last overhaul at Derby during March & April, this recent overhaul would allow it to operate beyond the summer of 1975, a time when many would be stored/withdrawn. On November 10th (or 11th?) the locomotive was involved in a minor collision at Bangor with the 1J53 16.50 Holyhead - Manchester, presumably the damage was of a minor nature. Photograph courtesy Stephen Dowle On February 21st 24044 & 24057, the latter still in green livery, arrived at Bristol with a freight from Holyhead. The picture above shows the pair dropping down onto Bath Road Depot. This location was no stranger to the Class 25s, however the Class 24s were very infrequent visitors here, especially in the twilight of their careers. 24057 is still in green livery, surprisingly it visited Derby Works shortly afterwards for overhaul, gaining blue livery and one of the last Class 24s to receive a heavy repair at Derby. Photograph courtesy Tom Sutch A fine study of 24044 at Springs Branch on May 14th 1975, which provides an interesting contrast with the opening picture on this page. Obvious changes include the sheeting over of the gangway doors and the plating over of the footsteps/handholds to the roof level water filler. The boiler room grill has been fitted with a solid blanking plate and the builders plate has been moved to the cab door. On September 25th the empty stock for a Leamington (?) - Aberystwyth (?) day excursion was delivered by 24044 & 24064, possibly then working the train forward to Coventry where a Class 85 took over. The Class 24s then ran light towards Birmingham, possibly to Bescot. 24044 just made it into the New Year before being withdrawn during January and stored, like many others at Crewe. On October 18th 25245 hauled 24026/31/44/76 from Crewe to Swindon Works. By the end of January 1977 24044 was no more. Page added February 9th 2005. Last updated April 14th 2019.